This page contains stories about eateries, restaurants, street food and taverns visited while traveling. Quincy on the left and Molly on the right. Goldendoodles. 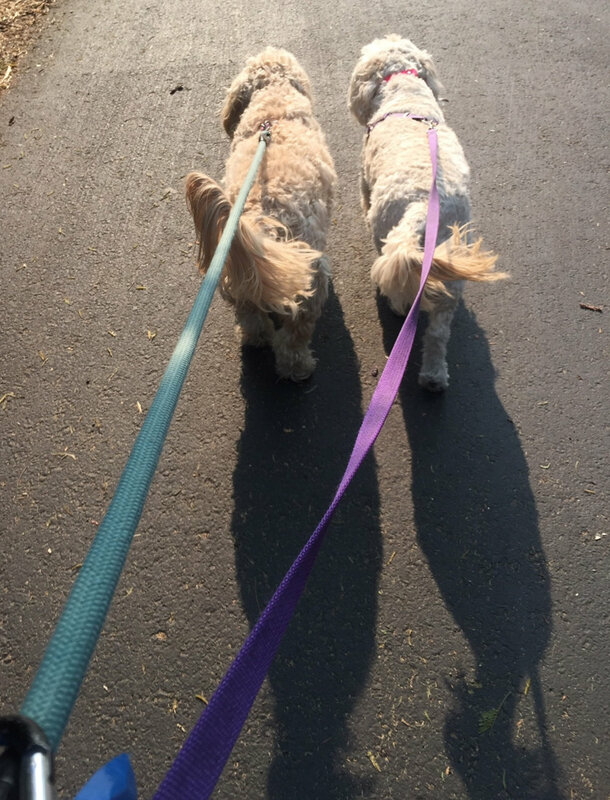 10 days with two Golden Doodles, traveling from Mount Shasta to Larkspur via Ukiah with friends and food on my mind. I traveled from Mount Shasta to Larkspur via Ukiah. I was going to be in Marin for 10 days dog sitting Molly and Quincy, Golden Doodles cousins. and share some meals with long time friends. Marin County bound after coffee and a breakfast burrito at Seven Suns. The drive south on the Nickel through the post Delta Fire landscape gave me a clear picture how years of drought and climate change are impacting my local environment. The landscape looks more like the surface of the moon than the usual lush deciduous and evergreens. Shasta Lake was about 100 feet below the dam crest. The hillside after the Delta Fire. They were still cutting trees and doing erosion control. The skies were clear over me until I got down to Williams then I drove into the smoke that was being moved all the way into the Bay Area by the winds. Highway 20 snakes through the Coastal Range, above Clear Lake and the small towns along the way to Highway 101. The oak laden hills along the road were scarred from past fires. I did see a pair of magnificent elks grazing in a small clearing. The entire drive from Williams to Ukiah was engulfed in smoke. Unfortunately it was smoky every day I was there from the Camp Fire. Many of the restaurants we visited had outdoor seating, but were closed because of the very poor air quality. Leaving Ukiah and driving south on 101 through the vineyards and into the housing developments, shopping malls and the dense population of the bay area is always both shocking and comforting. I lived in this part of the world for about 30 years so there is a sense of familiar, memory and personal history related to people and places. I went to college at Sonoma State as an Anthropology major. We traveled throughout the area doing survey’s and I Even got to work on a dig at the Soscal Trading Post in Napa before the site was paved over by highway 12 Soscal bypass. I enjoyed my visits and meals. It’s always fun for me to get away from my small town of Mount Shasta. I get really excited about eating at restaurants I’ve never eaten at before. I can’t do much of that in Siskiyou County! But nothing is better than seeing friends and telling old stories, catching up on what’s new and laughing!! Click on the link to the reviews and view more photos.